MY2000 is a bit different than 2001-2003. A6 grills for $15/pr fit with a lot of trimming but need to be wired or ziptied into place. Not perfect but hard to notice and better than a hole. I have been meaning to trim up a set for my A8 which has OEM grills so I can keep the OEM grills in a safe place while I plow snow with the facia. Who are you? And what do you know about D2 A8? These are not D2 grills. I'll have to pass. You have to love the internet where you can have a board just for enthusiasts of a specific type of car where people can ignorantly spout off about car parts they clearly know nothing about. Takes some nerve to start posting in 2017 (your first post is this year) about a car built 17 years ago that enthusiasts have been discussing for 17 years like you know something we don't. No good sir - you are wrong! These are original factory A8 grilles taken from a 2000 A8. 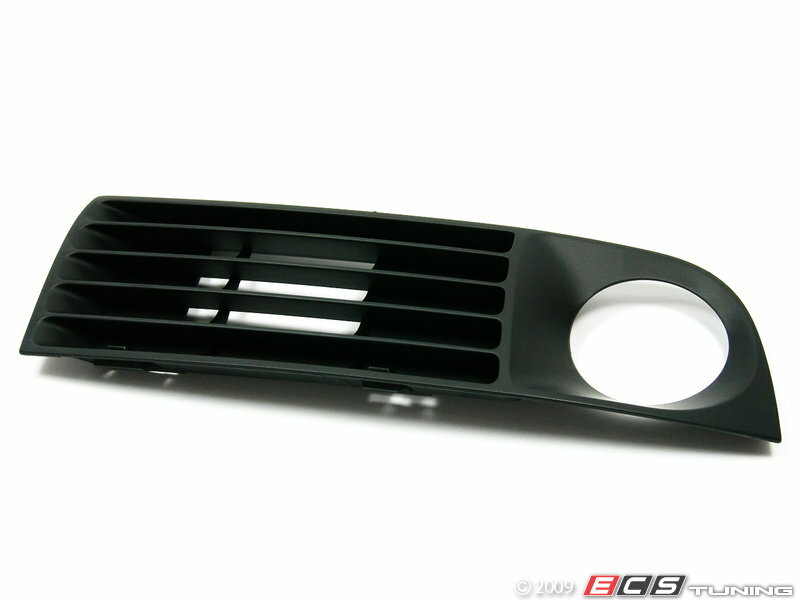 I recently bought brand new oem grilles and as i recall they were one part with round fog light opening. While this may have been one of my first posts, I certainly DO know quite a bit about these cars. I've owned this particular A8 since 2009 and have been working my Porsche's and Audi's for 25 years. So, I'm certainly not a noob like you assume. Sorry but the grill that you show is NOT the one I need for my 2003 (still a D2) A8. While my car is listed as 2003 model, I always have to do parts searches as a 2002 because almost always, the part I find is for a D3 and will not work on my D2. Mine is the same as the picture in the previous post. Here's picture of the remaining one that I still have. It is possible that there were 2 couple of different types for the D2's but clearly, yours does not cover my need. Be careful saying the some of us "clearly know nothing about" these cars. Pictures don't lie.... And a picture of the car for good measure (back when both grills were in place). Last edited by [email protected]; 02-05-2017 at 08:19 AM. You need to be carefull! You confused the conversation by saying it didn't look like your 2003 Grille. If you knew half of what you are purporting to you would know that the 2000 grilles are different. Nothing unusual about that. When you enter a search for a car part on a website you enter the year of the car because parts vary from year to year. If my post had said Audi A8 grill. Or D2 A8 grille you might have had a point. But it said "2000 A8 Fog Light Grilles For Sale"
You chimed in "these are not D2 grilles". Since I was attempting to sell them you were effectively calling me a shyster or a fraud. Instead of changing the subject to your owning an A8 since 2009. (bought my first one in 2000) you should have been apologizing for the confusion. Instead of apologizing you are warning ME to be careful. You should have checked your facts before you shot down my post. I was careful, I listed the specific year that the part fit. You be carefull next time! Perhaps I should have said, "these parts are not the same grills as the ones on my D2". You assume too much otherwise. Have been waiting to find one under $100 -finally found one! I got them from german wholesaler for 70eur/piece plus shipping 90eur(but that was altogether with lower valance(280eur).Could be less if you email them. I need the other side.... I'll keep an eye on on eBay. Have been for a while.